Have you ever wondered “When is a rescue not a rescue?”. The answer is simple – when it’s Wendy Laymon’s Newest Scam- Rescue a French Bulldog. I’ve written before in the past about various types of internet scams and cons that revolve around ‘adopting’ homeless French Bulldogs (or English Bulldogs, or Yorkies, or other pricey, popular breeds). Avoiding this scam: Learn to differentiate between a real rescue group, and a company selling puppies. A legitimate rescue will be well organized, well established, and often times a registered charity. There will hardly ever be cute young puppies available, since there’s no lack of homes waiting for adorable puppies. Most rescue dogs are older, with many in need of veterinary care. As with the other scams, use common sense! 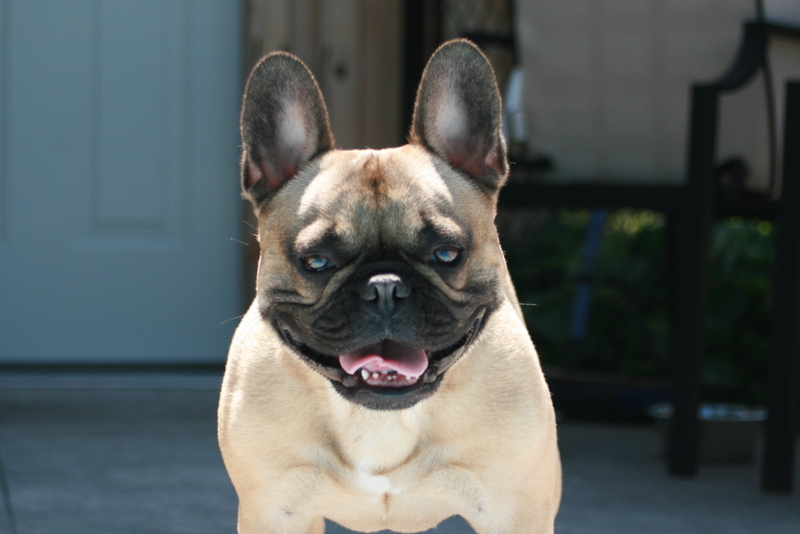 Recently, I ran across the website for Rescue a French Bulldog, a new internet based French Bulldog “rescue” that set off all of my warning bells. The bottom right hand corner of the front page of their website featured a distinctive looking brindle pied dog, poised in mid jump. It was Gary (aka “Gary, not from France”), Michelle Wynn Tippets recently deceased and much missed Frenchie. I contacted Michelle, and received an almost instant reply – No, she had NOT given them permission to use her photo, and No, they did not ask for it. What kind of rescue uses stolen photos? The more I looked, the more wrong almost everything about this ‘rescue’ seemed to be. While their website is emblazoned with paypal donation buttons asking visitors to help ‘care for’ their dogs in need, everything else on the page sets off warning bells. Their website proclaims them to be not just a 501(c)3, but also a “licensed shelter”. I know a lot of Frenchie rescue groups, and they’re all getting by on a shoe string budget and a prayer, but these guys have already set themselves up some sort of Frenchie sanctuary? The French Bulldog community, and the French Bulldog rescue community in general, are a close knit bunch. If some sort of philanthropic Uncle Moneybags had endowed a home for wayward Frenchies, we’d all know about it. Instead, the Frenchie grapevine was remarkably silent about “Rescue a French Bulldog” – none of us had ever heard of them, none of us knew of a dog they’d placed, and all of us were instantly suspicious, and our suspicions only grew when we looked at their “Available Dogs” page. Rescue a French Bulldog had to be either a scam, or the luckiest Frenchie rescue group on the planet. While the rest of us get the dogs that no one else wanted, Rescue a French Bulldog’s dogs were all young, healthy and apparently “perfect”. No seniors. No handicapped dogs. No special needs dogs. No dogs returned for behavioural issues. As someone who deals with rescue on an almost daily basis, I know that the odds of a rescue having nothing but perfect dogs available for adoption are akin to the odds of winning the power ball lottery. Twice. On the same day. Obviously, something was up with Rescue a French Bulldog, but none of us were really sure what. In the next day or two, we’d find out that it was even worse than we’d thought, and it all had to do with a Missouri commercial breeder named Wendy Laymon – aka Wendy Faith Laymon.